Jill Whalen has become one of the most respected (and possibly controversial) figures in search engine marketing. She’s been around since the early days so she’s seen first hand how SEM has evolved over the years. If you read Jill’s newsletter you know she has never been afraid to speak her mind. This, along with her success in the SEM industry has gained her significant notoriety along with a fair amount of criticism over the years. Jill was kind enough to let me submit some interview questions to her, but instead of offering the typical run-of-the-mill interview questions I also wanted to ask a few personal questions that allowed her look back at some things she has done or said that might have been misrepresented or taken out of context. I also wanted to get her take on some current hot topics as well as ask her about some issues that her and I have may have differed. 1) The SEO world seems to have a love/hate relationship with you. While on one hand you have a following that many might call “cult-like”, on the other you have many, many detractors. You are obviously successful at what you do but some of the more technical in the industry might call your advice simplistic. Can you explain your overall philosophy toward SEO, whether you believe that “algorithm chasing” has any merits whatsoever, and perhaps touch on why you think some in the industry have taken to criticizing you so vehemently? The criticism is somewhat of a non-issue anymore (or else I just haven’t been noticing) as the stuff you’re referring to is many years old. However, when you’re someone who has opinions and are not afraid to state them, you will of course have detractors. I’d rather speak my mind and get a few people to think, even if it means that some whiners will call me names. Many of those who used to disagree with me in the past didn’t always read what I wrote very carefully, and instead would automatically only hear what they wanted to hear, as opposed to what I really said. So, someone might point to an article I wrote and say what they didn’t like about it, and then others who never actually read the original article, would provide their comments based on the other people’s comments. What happens then is you end up with people disagreeing with you over things you never said to begin with! But, like I said, this is old news, and I really don’t see it happening very much these days. As to my overall philosophy toward SEO, it’s very simple and it hasn’t changed very much in the 10 or 11 years since I’ve been doing this. If you want your site to show up in the search engines when people type in keyword phrases that relate to what you offer, you have to think like a search engine. What types of pages should show up under any given phrase? What would be the most relevant page you could imagine? Once you’ve got that figured out, you basically just make your pages be that way, then start spreading the word to the world. SEO is part art, part science, but mostly common sense. Regarding algorithm chasing, that’s just dumb. I’ve been saying it was dumb for 10 years, but you’ll notice that the algo chasers of yesterday now even agree that it’s dumb. I can’t think of anyone who’s been in the business more than a few years that believes in algo chasing anymore. Why would anyone want to figure out how to beat a formula that is just going to change at some point, only to have to figure out the next one, and the next one, and the next one? Especially when if you just use some common sense and a big dose of creativity, you can create pages that for the most part fit all the algorithms. Seobitch.com – What happened to that? Can you tell us a bit about your (intended) strategy for each of these, what might have changed along the way as well as your continued strategy for moving forward on any of these? Wow, what a blast from the past. I’m surprised you didn’t have RankWrite.com in the list! I doubt anyone really cares about my old blogs and stuff, but just like most people, I put up a site with the best intentions, and simply get busy with other things and/or lose interest. I actually own a whole bunch of other domains too. When I think of something cool, I think, “oh, that would be a cool domain name!” and I buy it. (I think it’s funny that people say there are no good .com domain names left. There are tons, I think of them all the time!) Usually I just park them, but every now and then I am inspired to do something with them. The JillWhalen.com site was purchased because Register.com once offered me the domain for free for a year, so I figured, what the heck! I’ve used it over the years for testing out various SEO methods, and even though it doesn’t have anything new on it, it actually has some SEO tests contained within it that I refer to now and then to see if the engines have changed how they handle certain things. I do add or change things in the template sometimes for testing purposes. In fact, just the other day I checked it to see how the engines were handling very long Meta description tags. The results were somewhat surprising and very interesting! The seobitch.com site was a domain I purchased as a joke after one of the SES conferences where I was joking about it, and only had it up and running for a couple of months. I haven’t owned that domain in years. StuffYouMightLike.com was created as a place to publish all the reviews I do in my newsletter for various SEO products and services. I haven’t had much time lately to do reviews though, so it’s mostly the older ones I did. It still comes in handy to me when someone asks about a specific product I may have reviewed, I just refer them there instead of having to dig through my old newsletters to find the appropriate edition. The problem with trying to keep up with those sorts of things is that I have to be inspired to write. And I write all day long on my forum and other forums, plus in my newsletter and of course in emails and via IM. None of those things seem like a chore or real writing, but when it comes to something like a blog that you don’t even think anyone is probably gonna read anyway, it gets hard to actually sit down and just do it. I find that I generally have to get an idea in my head and let it germinate for many days or sometimes even weeks. Once I’ve done that, when I do finally sit down to write about it, it then comes out very quickly and easily, and it’s usually very good. (I often do this with newsletter articles as well.) But none of my sites besides High Rankings is really done for anyone but myself. They’re really just for fun. 3) For years you’ve claimed that your success in optimization lies in building great websites that naturally attracts visitors as well as links. For new sites SEO can often be a catch 22; they need links to get good rankings, but can’t get good rankings without links. Do you see it differently? I don’t do a whole lot of work for new sites, so the catch 22 is rarely a problem for me or my clients. I much prefer to work with a well-established business that already understand marketing and advertising. They understand the fact that it takes money to make money. That said, I am willing to work with a few select clients who have a new site if and only if they have a unique idea that they’re passionate about and they’re willing to spend the time and money to create something great. That is, a great business and a great website. If you have an awesome idea that hasn’t already been done before and are not simply another in a long line of me-too-copy-cats, you can indeed start from scratch and succeed. Not over night, but certainly in a few years you have the chance of being very successful. Unfortunately, too many people don’t want to wait a couple of years. As far as links go, many SEOs are mistaken about how many links a great site needs to succeed online. A handful of decent ones can usually plant the seeds for many more down the line, assuming again that we’re starting with something great. If you made me start with something dopey, or something that has already been done to death, then I’d agree that it would be hard to attract links. But if you’re starting with something dopey, you’re doomed to failure anyway. 4) Aside from simply turning a website into an excellent resource, how do you first attract visitors (and links) to a new site that you might be optimizing? Well, again, I generally don’t work with new sites. But let’s say I have a client that fits the criteria I mentioned above. They have a product or service that is in one way or another unique, along with a unique selling proposition, good price, and all those things that make it be something people would want to have. When you have that sort of site/business/product/service, it really does sell itself. The trick is to simply make others aware of it. How do you do that? Just like you would any product or service — you market it, you advertise it and you start a publicity campaign for it. Did you see Jennifer Laycock’s Zero Cash and 30 Days series? That was the epitome of what I’ve been writing about for years, only Jennifer did it much better and with much more creativity than I could have ever thought of! (I’m an SEO not a publicity agent, so I leave that part up to others.) What made Jennifer’s project and products so good was the creativity. Had she been lazy she would have come up with product slogans that were just run of the mill that anyone could have come up with. Instead, she used her creativity and came up with irreverent slogans that one would never expect. She also was creative in many other aspects of her marketing. The older I get the more I understand that creativity is the name of the game for everything in life. It means the difference between being a wannabe and being a success. 5) We’ve recently expressed different views regarding reciprocal linking and many are now calling any reciprocal link trades a black or gray hat process. Can reciprocal linking, if done to serve the visitors, be a good marketing strategy? If your site is linked to from other sites that have a similar target audience as yours, and if you are providing your site visitors with links to other sites that they might find interesting, then of course it could never be a bad thing. I was doing reciprocal linking back in 1995 and 1996 before there was a name for it. At the time, I called it a “custom submittal.” I stopped doing them many, many years ago though because they were simply way more trouble than they were worth. I imagine these days, they’re even worse! If you’re a small business, I’m sure they’re still a decent way of creating some traffic to your site. But, most business websites — certainly most larger companies — just don’t have the need for a reciprocal links page. There are just so many other ways to get links. Large companies often are partnered with all sorts of vendors. There’s very often ways to maximize those relationships if you think creatively about it for awhile. And what about your customers? Is there some incentive for them to link to you? But, like public relations, that’s really outside my realm, so I leave it to experts like Debra Mastaler of Alliance-link. I’ve found that everyone has their own area of expertise, and it’s best not to try to be everything to everyone. 6) Along those same lines, many believe search engines are devaluing reciprocal links altogether. I believe this would have an extremely negative effect causing many people to no longer link their website out to other websites that might already be linking to them in fear of losing any linking value that might be attributed by search engines. Do you feel that search engines are taking what some might consider to be a good marketing strategy and turning it into a negative? I’ve read your statement and question a few times, and each time I can’t get past what I perceive to be faulty logic. If people are only trading links to begin with because they think it’s good for their search engine rankings and for no other reason, then that’s just plain dumb. Why? Well, for one thing because they will always make the wrong decisions about what links they show to their own site visitors. Since their goal with their links is not to make their site the best it can be for their visitors — but to instead trick the engines into thinking that these other sites actually like them — they will link to stuff they wouldn’t otherwise link to. If those types of people stop linking to other sites, nothing is lost since they were only doing it for the perceived search engine ranking value it would provide. Those others that are linking to sites because they really do like them and think they will be valuable to their own site visitors, would have no need to suddenly stop linking if the engines devalued them. They wouldn’t care. Remember, devalued simply means they might not help search engine rankings anymore. Nobody has ever said that a search engine would penalize for reciprocal links. The search engines have no desire to dictate who anyone links to or doesn’t link to. Their only desire is to provide the best search results they can to their searchers. As to the search engines taking a good marketing strategy and turning it into a negative, that just doesn’t make any sense to me. The search engines have nothing to do with what links you put on your site or don’t. If you choose to build your marketing strategy over some perception or misperception you have about what search engines want, then it’s you who are turning your strategy into a negative. Either the strategy works for you by bringing you more traffic directly or through higher rankings, or it doesn’t. If it doesn’t, then don’t do it. 7) You recently stated “You either are deceiving an engine (blackhat) or you’re not (whitehat)”. Earlier in that same thread said ” I really don’t think there is such a thing as gray SEO” but later clarified, “Although I would also add that link building schemes that are used to trick the engines into thinking certain links are a vote when they’re not. I suppose this is where we probably do get into some gray areas, now that I think of it!” Without rehashing the old black hat/white hat debate, can you give us your thoughts on other SEO techniques (including link building) that are not about deceiving the search engines but you feel are not legitimate techniques? Yes, there is definitely deceptive seo and non-deceptive SEO. I can’t think of any spam techniques that are not deceptive. That’s what search engine spam is — deception. With linking, it can get gray only because it’s impossible to determine the intent of a link. Deception is something that can only be done deliberately and with intent. But where linking is concerned, it’s harder to figure out the intent than it is with on-the-page spam. Certainly, a link that is obtained for no other reason than to subvert the link popularity algorithms, would be deceptive and considered to be search engine spam. But, how is a search engine to know why the link is there? Is it a vote that they want to count? Or is it simply a trade or an ad buy? The difficulty in being able to determine the intent of most links makes it easier for people to get away with deceptive link building strategies than other forms of spam. 8) Google says that you should only do things to your site that you would do even if search engines did not exist. I can think of many times that we requested clients make changes to a site strictly for optimization purposes that had no impact on its ability to sell. Do you believe that this is genuine advice or just a way for Google to make a point about keyword stuffing, hidden text and other spammy techniques? Google actually “stole” that bit about only doing things you would do if the engines didn’t exist, from my very good friend and colleague, Alan Perkins. He wrote a white paper called The Classification of Search Engine Spam in 2001 that mentioned this concept. Interestingly enough, when I first read the paper, I disagreed with it. My thoughts on SEO had not yet evolved to the point where I could actually understand the concept of not doing anything that you wouldn’t do if the search engine didn’t exist. I had many online debates with Alan about it. A couple of years later (or maybe more) I reread his paper and to my astonishment, I agreed with every word he wrote. I have to say that I was shocked and thought for sure that he had substantially edited the paper since my first reading. I emailed him to find out if he had, and he told me that it had not undergone any content changes at all. So if the paper didn’t change, what did? My own maturity and experiences and my understanding of the difference between SEO and search engine spam changed. Alan was light years ahead of most people in his understanding of that concept when he wrote that paper. I think anyone in this business for many years will also (eventually) come to the same understanding. In answer to the question, yes, I honestly do believe that nobody should ever do anything to a client’s site just because they think it will help its search engine rankings. If it doesn’t make the site better for other reasons as well, say because it clarifies the site’s message, for instance, then it would be a mistake to do it. The reason may sound a bit confusing, but hear me out. When you make a change to a site that is of no real benefit to it other than you think it might help it get higher rankings, it won’t actually work as a long-term strategy. This is because search engines aren’t looking for sites that are the best for their algorithm, they’re looking for sites that are the best for their searchers! I know this won’t make sense to everybody who reads this, but for those who stay in the SEO business for a long time, I bet it will eventually “click” to them. Follow-up: I fully agree with your statement about what search engines are looking for, but it seems that SEOs often make changes that are primarily for search engine benefit and have little or no bearing on what’s good for users. And they should never do that. It’s a mistake. A common one, but still a mistake. No, not at all. If they actually changed their navigation so that it would be more accessible to lots of browsers, pdas, people with disabilities, then they’re making their site better all around. That’s what’s so great about real good SEO. It helps so many other things when you do it right. Sure, your original motivation might be search engines, but the beauty is that the effects are far reaching (in a good way). Problems come in where people actually make their sites WORSE for users some how when they do SEO. And that’s way more common than I like to even think about. 9) Rand over at SEOmoz recently said “My personal opinion is that you can’t be an SEO “expert” without understanding the black hat side of the debate – the techniques that are working, those that don’t, how money is made in that sector, and what the latest in hijacking, link spamming and automated content looks like.” This stuck out to me as something that I don’t fully agree with. Without trying to pit you against Rand, do you agree or disagree with that statement? I think there are definitely some benefits to understanding some of the techniques used to spam the engines. For one, you need to be sure that you or your client’s aren’t inadvertently doing something similar. Although it’s very difficult to mistakenly spam the engines, there are some things people might legitimately do on their site that could get caught up in a spam filter because the technique was previously abused by spammers. If an SEO doesn’t know about or understand the technical details to a certain extent, it would be difficult to do certain portions of their job correctly. 10) You once said (and I’m paraphrasing) that there are so few SEOs that really know what they are doing that you could count them on one hand. Do you really believe that there are so few quality SEOs and SEMs out there? I’m guessing if I made that statement at all that I would have said you could count them on 2 hands not one hand. There’s definitely at least 10 quality SEOs out there and not just 5! What I believe I probably said that’s related to this issue is that at least 80% of those that call themselves SEOs really don’t know what they’re doing. I think it’s probably more than 80% but let’s give them the benefit of the doubt! What’s really scary is that many times it’s the very large SEO companies that are the worst of the lot. Incompetent SEOs is a much larger problem for our industry than deceptive SEOs. The incompetents take people’s money for a service that they simply cannot provide. At least the search engine spammers (the competent ones) can generally do what they say they will do. 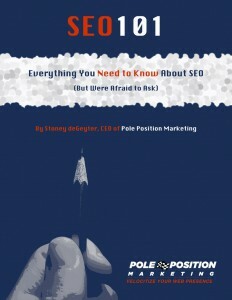 There’s so much information about SEO out there today that it’s very easy for someone to read up on it and then talk a good game to potential clients. But talking about it and being able to deliver results are definitely not the same thing! I want to thank Jill for her time. I have to say it was fun (we volleyed back and forth quite a bit) and that I think her answers are insightful. Best of all, she was more than willing to put up with my off-beat questions!